This Teriyaki Chicken recipe was recreated after trying so many times at different Japanese restaurants. My family loved this dish so much and praised it's just like the one we tasted in a nearby restaurant. It's so easy to make within minutes. Japanese cuisine is always on our family’s menu. Having tried to cook this Teriyaki Chicken, my dear daughter commented that it just liked the ones she enjoyed in Japanese restaurants. Well, I was thrilled when hearing this comment. You probably share the same feeling with me when our loved ones like and appreciate what we cook for them. Indeed, it’s a big reward. That’s all what I aspire to achieve in cooking. I didn’t use the ready-made teriyaki sauce, but just some mirin. 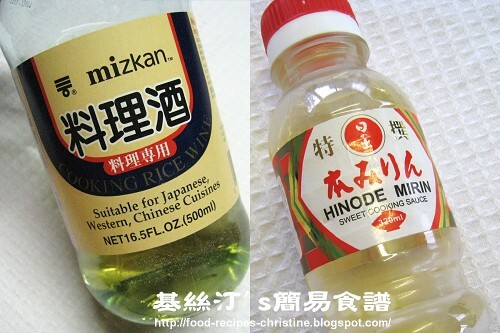 Mirin is a wonderful ingredient in Japanese cuisine. You can use it to create many different kinds of Japanese dishes. Keeping one bottle in the fridge can easily cook a delicious Japanese dish on the go. Rinse chicken fillets and wipe dry with kitchen towel. Trim them if needed. In a bowl, mix all marinade ingredients together. 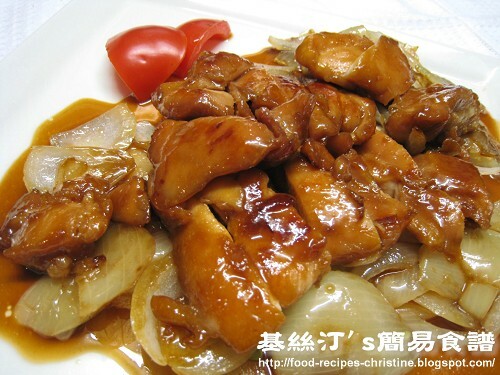 Marinate the chicken in the mixture for 15 minutes. Heat some vegetable oil in a frying pan and sauté shredded onion on medium heat until soft. Set aside. Add 2 tablespoons of oil to fry the chicken until both sides are browned. Pour the sauce used to marinate chicken in the pan and bring to the boil. Cover the pan and turn to low heat until done. Add onion and quickly stir well. When the sauce becomes thick, turn off the heat. Serve on a plate. Pour thickened sauce over the teriyaki chicken. Done. 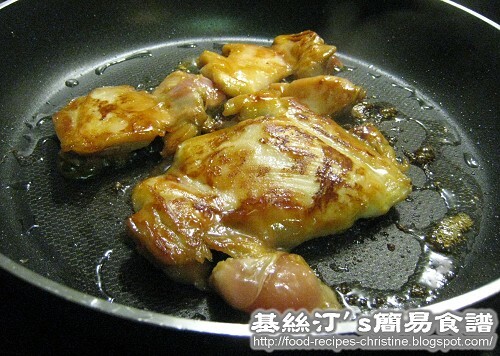 While frying the chicken, beware that the chicken will be burnt easily because some sugar added in the marinade. Don’t use heat too high. This dish can go with salad or steamed rice perfectly. I got the rice wine and mirin from my nearby Asian grocery store. You might try your nearby supermarkets. Hi Christine, can i use chinese rice wine instead or japanese sake? wht difference would it make with the two? No problem at all if you use chinese rice wine. Sake is a bit stronger in pronounced flavour. Hi Christine what would be the best substitute for mirin? Mirin is quite unique in taste. Am afraid that we can't find anything to substitute it. I edited and updated this recipe with a printer friendly version for you. Please click the link "Printable recipe", you'll get it. FYI, all the newly added recipes are already posted with printer friendly versions. For the recipes I've done years ago, I have to work backwards to edit one by one. It takes quote a lot of time. Please bear with me.